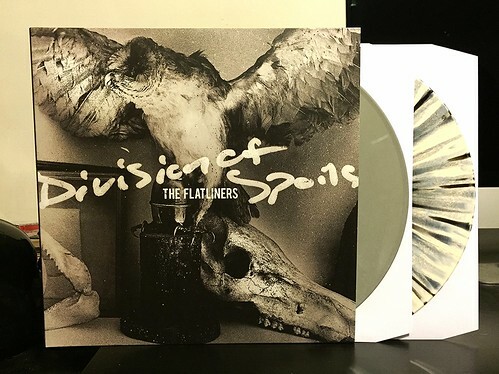 Prior to seeing The Flatliners open up for Rocket From The Crypt in Chicago a couple of years ago, I had never really paid much attention to them. They impressed me so much that night I started to keep tabs on them a bit more. This is only the second record of theirs that I have picked up since that night, but every time I hear more buy these guys I become more of a fan. Division of Spoils is a two LP collection of singles, comp songs and etc. While there are some great, great songs on here, I will admit that this is a really big chunk of music to try to get through in one sitting. An hour and ten minutes of any one band can be a bit much at times and I definitely show some fatigue whenever I pop this guy on. While I do think that a singles compilation is the one time where you can be more of a completist and err on the side of putting in too much, at about the fifty minute mark, it does feel like you've listened to more than enough. Still, there are killer songs on this album. The band plays a super energetic style of punk rock. It owes a debt to a Social Distortion style greaser vibe at times, but it's also equally as steeped in the Dillinger Four tradition of explosive hooks and huge choruses. Plus they even cover one and a quarter Rocket From The Crypt songs, so you're always going to get some bonus points from me for that. If you already like the band, it's a no brainer of a pick up. I'm not so sure that it's the best place to start off with The Flatliners for the first time. All I have from them so far is a 7" and this singles compilation. It's probably about time that I actually pick up one of their full length albums.